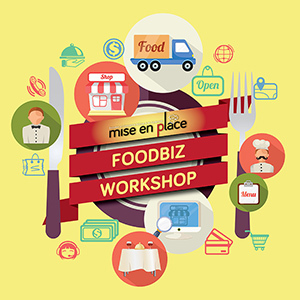 In the F&B industry, a business’s main function is to serve people – whether it’s food, services or a combination of these. For this crucial reason, the importance of staff training in a restaurant cannot be overstated as every job ultimately aims for customer satisfaction. 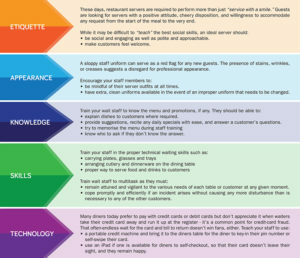 Employees in every area of restaurant service, from dishwashers to managers and owners, affect a customer’s experience. Without proper training, customer-staff encounters can go off track, affecting your bottom line. While training can be expensive and possibly time-consuming, the benefits often outweigh the costs involved. Staff training is an essential management tool to increase work effectiveness. Simply put, training is the process that provides employees with the knowledge and skills that are required to operate within the systems and standards set by the management. 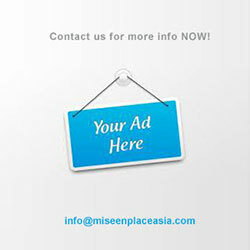 Consider the ever popular and often repeated quotation, “Give a person a fish and you feed him for a day. Teach a person to fish and you feed him for a lifetime”. This saying clearly explains the importance of training employees to conquer their work rather than just giving them a job of income. Employees are different from one another in many ways; they offer dissimilar skills, abilities, knowledge and background. Therefore, a major aspect of staff training is nurturing a sense of cohesion and teamwork between the staff, whether they work at the front-of-house or back-of-house of the restaurant. Effective teamwork usually occurs when team members know their roles, understand the work objectives, communicate effectively and solve problems efficiently. 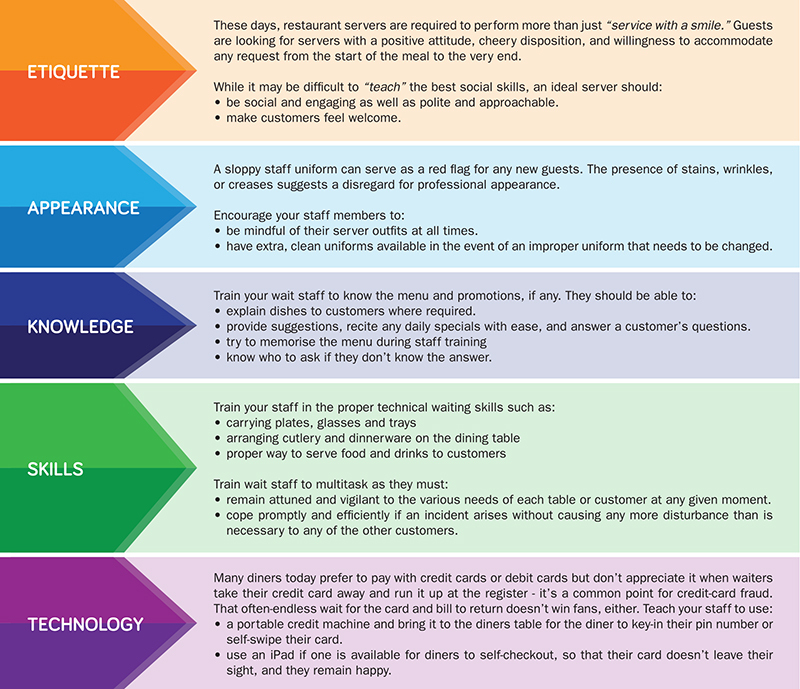 In too many restaurants, a divide exists between the front-of-house and back-of-house staff that often degrades the customer experience. When a customer complains, someone is to be blamed and staff begin to point fingers, especially during rush hour when etiquette and/or procedures seem to fly out the window. This causes mistakes, service bottlenecks, unsafe conditions, and overall dissent from those tr ying to do the right thing. No matter what, it’s a breakdown in your restaurant’s teamwork that causes a trickle-down effect: if the customer is unhappy, the staff will be too, and the business will be affected. Sometimes, especially with newer members, staff are simply not aware of the troubles they’re burdening the other departments with. Servers who don’t break down their dishes when delivering to the dish pit cause the dishwasher at the back-of-house unwanted extra work. On the other hand, cooks or chefs who send out unfinished, unattractive, or wrong plates cause servers in the front-of-house an undue earful and embarrassment from customers. Because of the perceived separation and lack of communication, staff members may not even be aware they’re causing a problem until it’s too late. 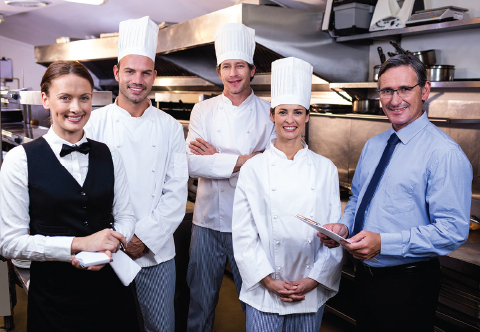 To promote teamwork, remember that your restaurant staff is like a sports team. Everyone has a position to play but in the end, they’re all striving for the same goal. Teach your team that crossing the barrier between the front of the house and back of the house is beneficial to everyone. With proper staff training, you can foster a positive working environment and united staff who will efficiently serve customers and contribute to the success of the restaurant. 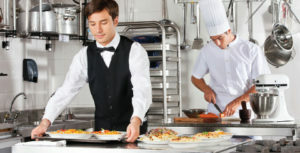 In order for a food operation business to flourish, the front-of-house and back-of-house staff must therefore work together to create a positive experience and end result for the customer. 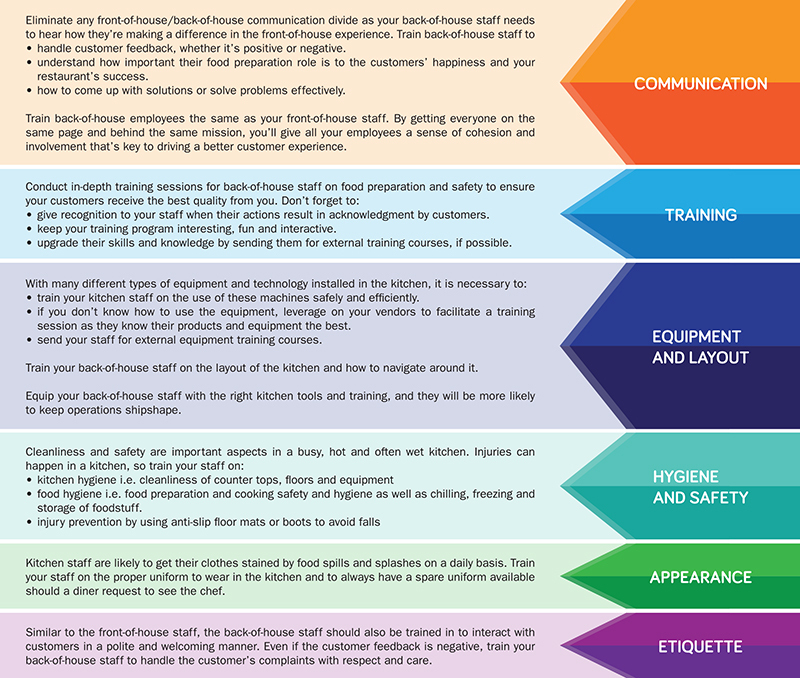 The term ‘front-of-house’ refers to all actions and areas that a customer will be exposed to during their visit to a food outlet i.e. the entryway, waiting area, dining room, bar, restrooms, and outdoor seating. On the other hand, the term, “back-of-house,” encompasses all the behind-the-scenes areas that customers don’t usually see when they enter a food service outlet i.e. the kitchen, store room, office, and staff’s break room. Understanding the differences between front-of-house and back-of-house functions will significantly help your business flow more effortlessly and increase efficiency. The front of the house staff represents the face of every dining establishment. These individuals will interact the most with your customers during a visit, and positive interactions can go a long way towards ensuring those same patrons return. 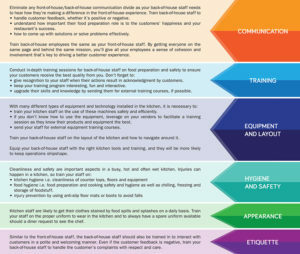 Below are some areas that training and attention must be closely given to the front-of-house staff. The back of the house is often called the ‘heart of the house’ as it acts as the central command centre where the food is prepared, cooked, and plated before making its way to the customer’s table. Everything your back of the house staff does will impact your customers experience in the front of the house and the key to unlocking their customer experience is through training. 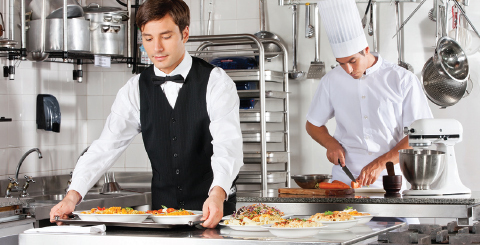 The food service industry is fast paced, competitive and constantly evolving. With customer expectations rising, providing ongoing attention to staff training will affect your business’s ability to remain competitive. With the right training, both your front-of-house and back-of-house staff can help you exceed them with excellent services that make your entire food business a star in your customers’ eyes and a recognised outlet in the F&B industry.